The mistake is buy [sic] the play side guard and center. The guard needs to slide out to take Kovacs and the center take Brinks. When the center sees Heinenger bail into zone, it's obviously a zone blitz and he needs to find the blitzing side and get the guard wide to pick up the safety. With and experienced line who has gelled and knows how to identify and pick up blitzes, this won't work nearly as well. I recall: 1) later the D looking something very similar to this and Kovacs dropping back and getting a tip; and 2) the D turning into a near feeding frenzy as the WMU OLine seemed so confused play after play. Hopefully this is the Mattison effect and it continues into the season. Fortunately, Western ran an almost identical blitz early in the second half. 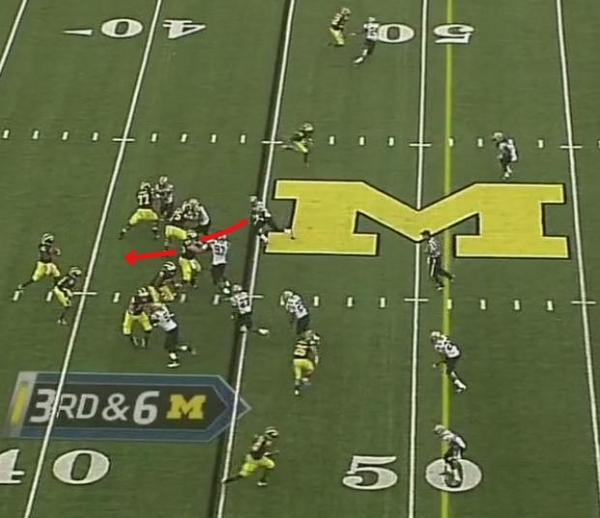 Michigan is in a four-wide set with Vincent Smith in the backfield. You may recognize the defensive alignment from the blitzes diagrammed earlier. Western Michigan is crowding the line of scrimmage with linebackers in an effort to disguise coverage and where the blitz is coming from. Much like the plays Michigan ran, WMU is in a three-lineman set with a NT covering the center and three men outside of the offensive guards (in this instance, we'll be watching the weakside blitz [top of the screen]). As the ball is snapped, Western blitzes all seven men on the line of scrimmage. The outermost linebackers for WMU begin to stunt inside. As you can see, Taylor Lewan is blocking the edge rusher, Michael Schofield is blocking the WDE, and David Molk is blocking the NT, leaving a hole in the A gap for the stunting WMU linebacker to blitz through unblocked. As the WMU blitzer shoots the A gap, blocker extraordinaire Vincent Smith recognizes the weakside blitz and steps in front of Denard to make the block. Smith steps up and chops down the WMU defender, allowing Denard to get the pass off (it will fall incomplete to Roundtree, mostly because this was at the beginning of the torrential downpour). I think we all would agree that Michigan's offensive line is more cohesive and talented than Western Michigan's, yet the Broncos were still able to get essentially a free blitzer into the backfield with the same stunt principle. Fortunately, Smith chops the blitzer before he can cause any real damage, but the schemes are what I'm concerned with. Notice also that WMU executed this stunt blitz on the strongside of the field as well. You can the WMU linebacker #29 about to shoot the strongside A gap between Molk and Omameh completely unblocked. 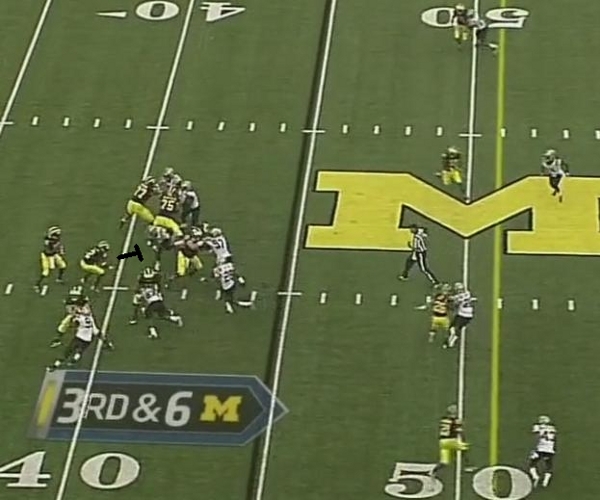 Obviously, there are some differences between this play and the ones Michigan ran. First of all, the WMU nose tackle rushed rather than dropping off into coverage. This changes the play in a number of subtle ways. Whereas Michigan blitzers Kovacs and Demens shot the B gap (between the guard and tackle), the WMU blitzers were attacking the A gap (between the guard and center). In my opinion, this probably made it easier for Smith to recognize and block the weakside blitz as he only needed to step up in the pocket rather than come across the face of his QB. Secondly, with or without the NT dropping into coverage, it's the guard's responsibility to block the defensive end shaded to his outside shoulder. Given that there are three players outside of the guard, including a DE at the 3-tech spot, it's the guard's responsibility to block that DE while the tackle is responsible for the edge rusher, and the running back is responsible for the stunt blitz. In this play, we see Schofield block the weakside DE (Omameh blocks the SDE), Lewan blocks the edge rusher (as does Huyge on the strongside), and Smith steps up to take out the blitzer stunting to the middle. 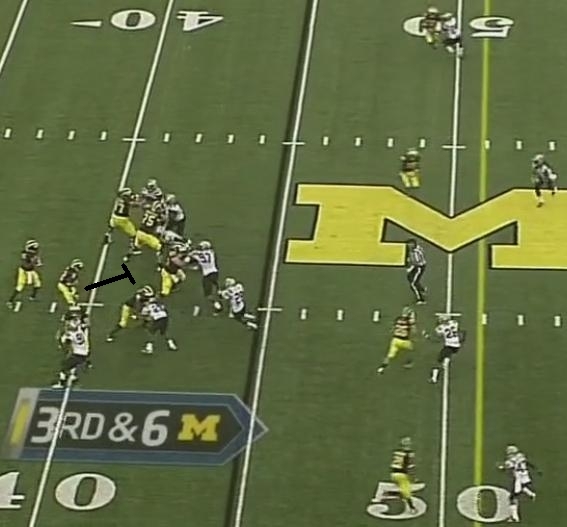 When Michigan used this concept, the NT dropped into coverage and the WMU center doubled the DE. 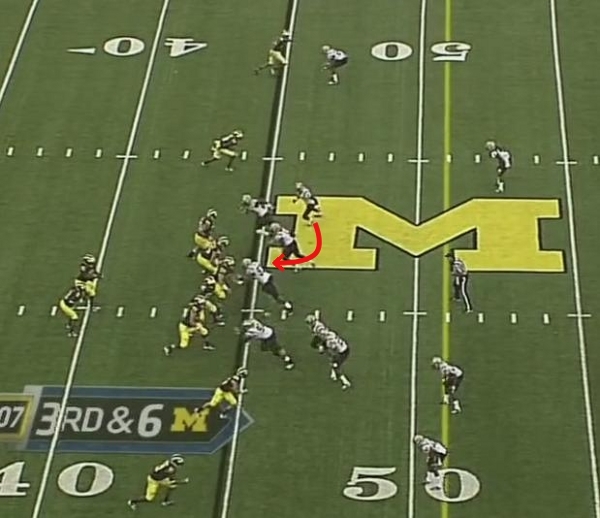 This necessitated that Michigan blitz the B gap instead of the A gap as WMU does here. The point is that Mattison's defensive principles are sound and will work independent of the opposition's skill level or coaching. The chances that Michigan can land the punishing sacks that they did against WMU against better opposition is unlikely as more skilled running backs will probably make the block that Smith does here, but I'm willing to risk sending Kovacs or Demens full bore against a running back in the backfield. For what it's worth, I'm still working on getting an open source video editor to do this myself. I think those are two seperate blitzes. 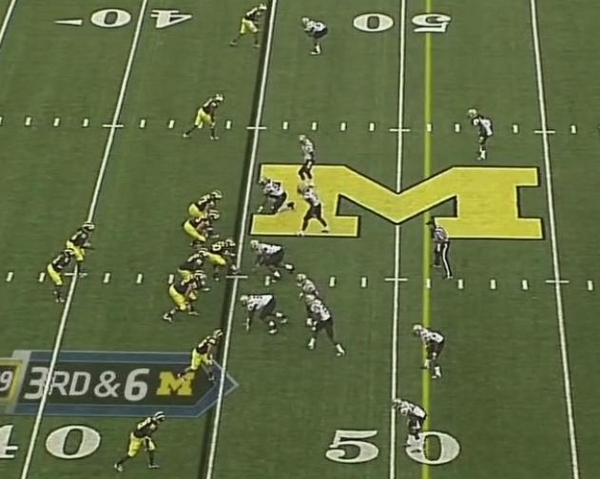 The WMU blitz is a man blitz and UM is a zone blitz. The UM blitz was a type of boundary dog where they show 7 defenders bring 4 drop 3 and play quarters over top. The genius is most zone blitzes play cover 3 over top not quarters. That means GM got pressure bringing 4 defenders against 6 blockers and still had 7 defenders in coverage against 4 recievers. The WMU blitz was a loose cover 0 with #29 having a stay/go call on VS. Meaning once he saw the VS was blocking he had the option to blitz or play a robber...it seems he choose to blitz which is why he came late. You're probably right re: #29. Though I think the stunt concept shown here is similar enough to the ones Michigan used with regards to freeing up a linebacker by overloading one side of the offensive line and stunting back toward the middle. Anonymous is entirely correct. The blitzes appear similar, but are significantly different. I played offensive line in college, and I found that a zone blitz is generally harder to block than a man blitz (if the numbers are equal), in that one defensive lineman that must be accounted for before the snap drops into coverage. In a split second, the offensive lineman who was assigned to that drop lineman must redirect himself somewhere else. Also, without video, it is hard to say what exactly the protection is. It doesn't look like a full slide, which is the best way to deal with any overload blitzes. Full slides aren't usually called, but audibled into. I don't know if Denard is doing many protection changes at the line. It looks (from pictures) like a man-slide, where half of the line blocks man, and the c-g-t on the other side block zone. Pretty standard. Pretty poorly equipped for this blitz, considering the RB is forced to block A. Credit to Smith for the pickup. Point is, the experienced line will always be much better at picking up blitzes. However, the single most important thing is picking up blitzes is being in (or audibling [word?] into) an optimal protection. Again, without video it's hard to tell what should have been done. If the QB is a in a 3-step drop, he should probably slide the line left and have Smith block the last defender to the right. That is a longer path to the QB than up the middle, so having your RB out there is safest. BUT, the original look of the WMU defense is even, not telegraphing in either direction. Credit to them. I just realized that this is the nerdiest thing ever written on the internet. Also, probably the most worthless. No video, no way to tell what really should have been done. Still, I love this stuff. Video added for clarification. As mentioned, I'm still working to get an open source video editor to use here. Now that I've seen the video, Denard should absolutely have audibled into a full slide left. First, the blitz (though it eventually comes from both ends) is being, if not telegraphed then certainly hinted at coming from the left. A Mac has moved left of center and has pressed the line. The other inside backer has his back turned from the QB, showing coverage. It looks like it could be a 4 man rush, but that is almost never the case with 3 down lineman and a Mac in the A. The left outside backer is also looking on ominously, even though he comes a bit later. Slide your line left, and you'll be OK. Here are a few reasons. 1. As mentioned above, it looks like the blitz will come left, as the Mac has moved up and the outside backer is semi-telegraphing. 2. It is a three step drop throw, so full slides are perfect, as the protection doesn't have to be great, just firm. Ball's coming out quickly anyways. 3a. The primary receiver is on the left, so it's nice to have your big, strong linemen block strong-side so as to avoid a blitzer getting too close to the QB and batting the ball down. That's why you always see lineman cutting ends down on slants and other 3 step drop routes. 3b. Also, if your line slides left, the back blocks the man on the end of the line right, and because backs can't block as well as lineman, you want him blocking someone as far from the QB as possible. Also, he should be to the QB's blind side so that his defender doesn't penetrate enough to interfere with the play. And because 3 step drops come out so quickly, there is just a very little chance that the defender, even if a monster of an end against a shrimp like Smith, probably won't get to the QB as long as he is mildly inconvenienced on his way. It's six in the morning, so I hope this stuff makes sense to people other than myself, but I just got back from Metro airport and I like to read about the U before going to bed. Thanks for the video. I wasn't intentionally being obnoxious (or even suggesting you put it up at all), I was just hedging my bets in case the motion picture gave a totally different look than the stills. It didn't. Denard should slide his line left and get the ball out quickly. With a sliding line, they basically form a wall, not blocking men but areas, rendering confusing blitzes rather easy to block (if only for a short time, which is all that was necessary for this particular play). I don't think Denard is that sophisticated, and I don't know if he is even allowed anything but real basic pass-run checks or run-pass key reads. Still, he'll have to be some day if we are ever to be good again. That's not confusing at all. Thanks for the input. I should start putting up video like this until I can upload it myself. It adds a lot to people's understanding of the play. So you weren't being obnoxious. I always love hearing from people with more experience than me.